FORT KENT, Maine (AP) — A nurse who successfully fought Maine’s quarantine for health care workers who have treated Ebola patients is free to go wherever she pleases, but her boyfriend on Monday was still staying away from the campus where he’s a nursing student. Ted Wilbur told reporters that the University of Maine at Fort Kent asked him to stay away as his girlfriend, Kaci Hickox, was in the news amid attempts to quarantine her after she returned from treating Ebola patient in West Africa. The university contends he voluntarily agreed to stay away, and the voluntary agreement remained in effect Monday. Ray Phinney, associate dean of student life and development, said the university is willing to revisit the agreement. Hickox, who contends she poses no danger because she’s not showing symptoms, fought attempts to quarantine her after returning from Sierra Leone. A Maine judge sided with her Friday, rejecting the state’s attempt to restrict her movement. The judge signed a final order on Monday. Even with the order, Hickox said she planned to stay away from public places out of respect for local residents. She and Wilbur are living together in Fort Kent in an off-campus home. The 21-day incubation period for Ebola for her ends on Nov. 10. Steve Hyman, one of Hickox’s lawyers, said there’s no reason for him to be prevented from setting foot on campus. He said attorneys plan to talk to Wilbur to see what he wants to do between now and Nov. 10. Tony Abbott, Prime Minister of Australia, addresses the 69th United Nations General Assembly at the U.N. headquarters in New York September 25, 2014. (Reuters) – Australia will fund an Ebola treatment clinic in Sierra Leone, Prime Minister Tony Abbott said on Wednesday, responding to pressure from the United States and others to do more to tackle the deadly outbreak at its West African source. Australia last week became the first rich nation to issue a blanket ban on visas from the three most Ebola-affected countries – Sierra Leone, Guinea and Liberia – sparking widespread criticism. Australia will provide A$20 million ($17.5 million) to staff a 100-bed treatment center that will be built by Britain and run by Aspen Medical, a private Australian company. Australia had already committed around A$18 million to fight the outbreak of the virus, but had been called on by U.S. President Barack Obama, opposition lawmakers and medical bodies such as Doctors Without Borders to do more. Abbott’s government had raised concerns that any medical staff infected with the disease would not have access to treatment and would face a dangerous 30-hour evacuation flight home. Britain had given assurances that any Australian staff infected with Ebola would be treated as if they were a British citizen, Abbott said. 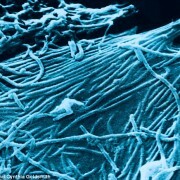 Ebola can take as long as three weeks before its victims show symptoms, at which point the disease becomes contagious. 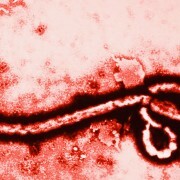 Ebola, which can cause fever, vomiting and diarrhea, spreads through contact with bodily fluids such as blood or saliva. World Bank Group president Jim Yong Kim on Tuesday criticized Asian countries for not contributing enough to the global effort to fight Ebola, despite having a wealth of trained medical personnel. “Many countries in Asia who could help simply are not, especially when it comes to sending health workers,” Kim told a news conference in Seoul. The World Health Organization says the outbreak, the most deadly on record, has killed some 5,000 people. 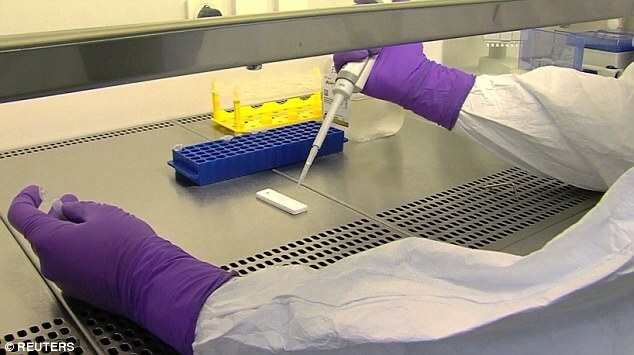 No cases have been diagnosed in Australia, although there have been a number of scares. 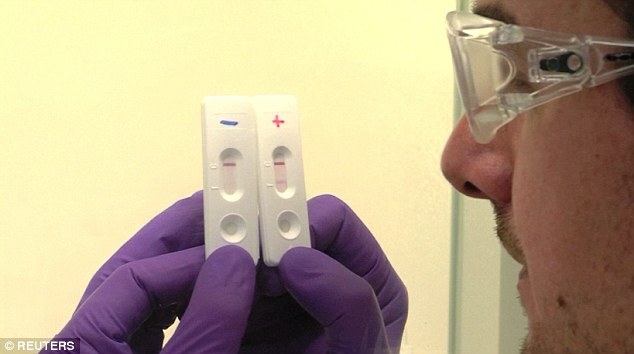 A nasal spray being developed as a potential vaccine for the deadly Ebola virus has been found to be effective. Scientists at the University of Texas discovered the breathable vaccine offers long-term protection during pre-clinical trials with monkeys. 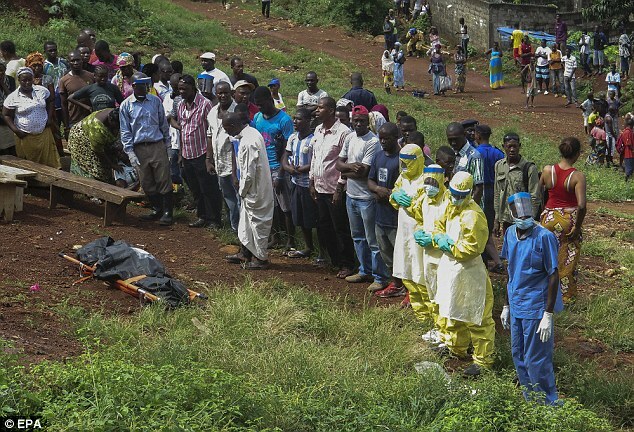 Since the current outbreak erupted in West Africa earlier this year, almost 5,000 people have lost their lives – the majority in Sierra Leone, Liberia and Guinea. A number of injectable experimental vaccines are being trialled in the US, UK and Mali, with plans to extend human trials into other parts of Europe, Gabon and Kenya. But researchers in Austin, Texas, say their small pre-clinical study is the only proof to date that a single dose of a non-injectable vaccine against Ebola is long-lasting. 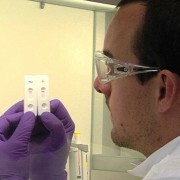 They claim the discovery could have ‘significant global implications in controlling future outbreaks’. A breathable vaccine could overcome the logistical obstacles of storing, transporting and administering injectable vaccines in parts of Africa most afflicted by the virus, the researchers said. The work will be presented tomorrow at the American Association of Pharmaceutical Scientists Annual Meeting in San Diego. Kristina Jonsson-Schmunk, a graduate in pharmacy and professor Dr Maria Croyle, and Dr Gary Kobinger and his team at the National Microbiology Laboratory in Winnipeg, developed the vaccine over seven years. 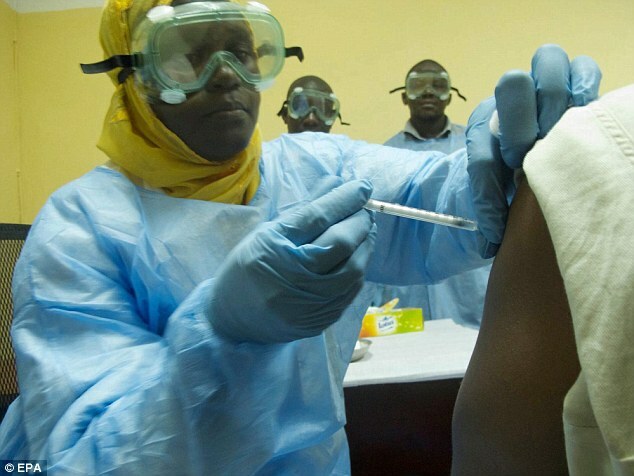 It was found to improve survival of immunised non-human primates from 67 per cent to 100 per cent, after challenge with 1,000 plaque forming units of Ebola Zaire 150 days after immunisation. It is significant because only 50 per cent of the primates given the vaccine by the standard route – an injection into the muscle – survived challenge. 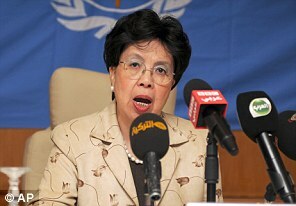 Ms Jonsson-Schmunk said: ‘Ebola causes devastating outbreaks with fatality rates of 25 to 90 per cent in Africa and Asia. ‘Although progress has been made in understanding the virus’ biology, no licensed vaccines or treatments currently exist. ‘The main advantage of our vaccine platform over the others in clinical testing is the long-lasting protection after a single intranasal dose,’ Dr Croyle added. ‘This is important since the longevity of other vaccines for Ebola that are currently being evaluated is not fully understood. 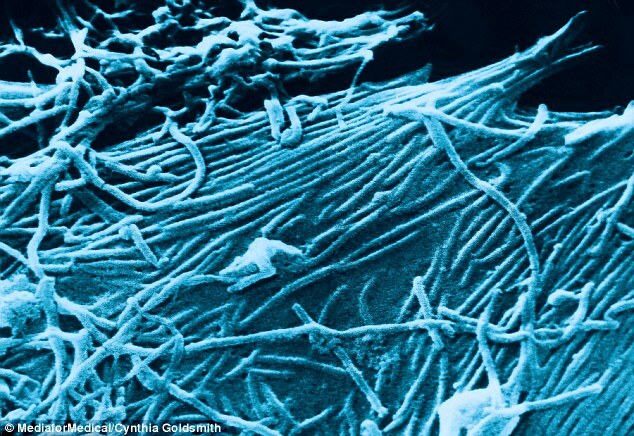 The current Ebola outbreak in Western Africa is the largest and most complex epidemic since the virus was first discovered in 1976, according to the World Health Organisation. With a fatality rate currently as high as 70 per cent, officials have declared this outbreak a public health emergency of international concern. The next stage of Dr Croyle and her team’s research is a phase one clinical trial that tests the effectiveness of their vaccine in human volunteers. They also plan to further explore their initial data they have collected for the administration of the vaccine as a thin film under the tongue in non-human primates. The study was published in the online edition of the journal Molecular Pharmaceutics. The head of the World Health Organisation’s scathing conclusion came as nearly 5,000 people have lost their lives to the hemorrhagic fever – the majority in Sierra Leone, Liberia and Guinea. NEW ORLEANS (AP) — Philanthropist Bill Gates says he wants to end malaria in his lifetime and will give more money toward that goal, part of his broader fight against tropical diseases that are getting unusual public attention because of the Ebola epidemic. In an interview with The Associated Press and in a speech Sunday at a global health conference in New Orleans, the Microsoft co-founder said his Bill & Melinda Gates Foundation would increase its malaria program budget by 30 percent, to more than $200 million per year. That’s on top of the foundation’s other donations to the Global Fund to Fight AIDS, Tuberculosis and Malaria. Small steps won’t get the job done, and scientists don’t have all the tools they need to eradicate malaria, Gates said. His plan includes developing a drug or vaccine to purge the malaria parasite in people who carry it without showing symptoms — a “human reservoir” that helps spread the disease. “I really do believe that malaria can be eradicated in my lifetime,” said Gates, who just turned 59. That is not the case this year. 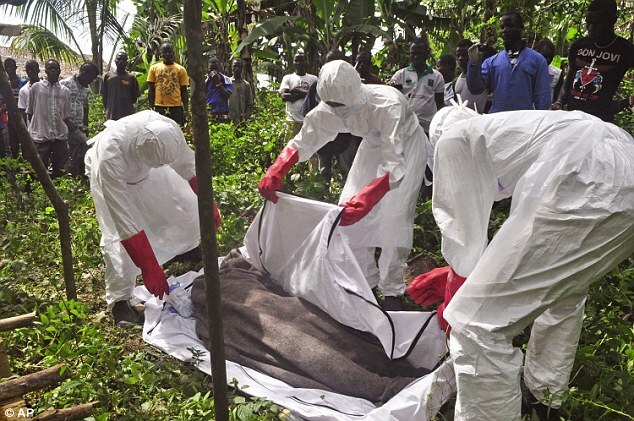 On Wednesday, Louisiana officials created a stir by asking the 3,500 people registered for the conference to stay away if they have been to certain West African countries or have had contact with an Ebola patient in the last 21 days, the maximum incubation period for Ebola. Conference organizers called the stance an overreaction to Ebola fears, and said it would prevent some scientists from presenting studies on the outbreak, which has killed about 5,000 Africans this year. In all, Gates said his foundation will commit more than $500 million this year to fight malaria, pneumonia, and diarrheal and parasitic diseases in poor countries. Here are some he discussed. The conference comes “at a pivotal moment in the history of global health” because of the world’s largest outbreak of Ebola, Gates said. He and his wife have pledged $50 million to help contain it and for research on treatments, rapid tests and vaccines. Another Microsoft co-founder, Paul Allen, has pledged $100 million, and Facebook founder Mark Zuckerberg and his wife Priscilla Chan, $25 million. The global response to Ebola initially stumbled and revealed flaws in our health systems, Gates said. Since then, some countries and groups have helped, but much more is needed, he said. “We’re likely in the next several decades to have an epidemic that’s more transmissible than this Ebola epidemic,” so bolstering health systems in all countries and ensuring investment in drugs and vaccines is key, he said. It kills more than 600,000 people each year, mostly children in Africa but also in Asia, Latin America and other areas. It is caused by parasites spread through the bite of infected mosquitoes. In areas where the disease is common, people can develop partial immunity — they carry the parasite but don’t get sick, and mosquitoes who bite them become infected and then spread the disease when they bite others. Efforts to control the disease, such as bed nets to prevent mosquito bites, must continue but “the only way to stop malaria is to end it forever,” Gates said. His plan includes $156 million over five years to the PATH Malaria Vaccine Initiative to develop vaccines that prevent mosquitoes from infecting people and vice versa. The idea of ending malaria in 20 to 40 years “is faster than most people expect,” but a good goal, Plowe said. Gates called polio eradication “my top priority,” noting the viral disease remains endemic in three countries — Nigeria, Pakistan and Afghanistan. He cited progress: Polio was eliminated in India earlier this year, and as of early September, Nigeria had confirmed only six wild poliovirus cases this year. There is a good chance of getting the polio case count down to zero for the entire continent of Africa, he said. The mosquito-borne disease, also known as breakbone fever for the pain it causes, has spread from a few countries a few decades ago to more than 100 today, including the southern United States. An experimental vaccine seems to prevent most severe disease and hospitalizations. Details of a major study on it will be presented at the conference on Monday, and Gates said his foundation would work to build on that work and make a vaccine available to all who need it. Another mosquito-borne disease, chikungunya causes fever and extremely painful joints. It spread to the Caribbean last year after expanding in Africa and South Asia, and in July, the first locally acquired case in the U.S. was documented in Florida. It’s an important field for research and vaccine development, Gates said.